Maureen Cracknell Handmade: GIVEAWAY DAY!! I couldn't resist joining in and celebrating with Sew Mama Sew's Giveaway Day! For this special Giveaway today I'm offering a bundle of my very first collection Wild & Free! Today's offer includes the EIGHT prints that make up this Limited Edition collection for Art Gallery Fabrics! That’s 3 possible entries! Enter now through Sunday evening, May 10th. The random # generator will pick the winner and I will announce their name at the bottom of this post! I think I'd have to follow your lead and make a few cushion covers! Pillows! Or a quilt. Pretty much anything, I'm in love with this collection. I think these would make a gorgeous scrappy hobo bag! Wonderful fabrics; thanks for the chance to win. Tank tops & tunics - so I can show off those awesome fabrics every day! I follow you with Bloglovin. Love Wild & Free! Well, I always choose to make a quilt when possible but I've been itching to try your herringbone QAYG so I might do a pillow. I would probably follow your lead and make a pillow! I follow you via Blogger - found you on the last give away day! Beautiful collection. I love Art Gallery fabrics--they feel so luxurious! I'd make a bunch of oven mitts and pot holders for Christmas gifts. These would make great pillows! I would make some cushions! i follow MCH in every way possible! I would make a large scrappy travel tote with this beautiful bundle! This bundle would challenge me to do it. Some pillows would be fun. Thanks for the opportunity! I would make sew-sew bags. That's the one with several zippers. I follow you via Bloglovin' and Facebook. Oh, this is adorable! I'd make clothing for little children. Bags or a lap throw. I follow along on Facebook. I shared the giveaway via Twitter. I love the arrow pillow you made. With a new house to decorate, I think I would make something decorative like that! I would love to use this fabric to create some wall art for my lounge room! I still need to make some patchwork curtains for our camper out of your line! I follow with bloglovin, FB, and IG! 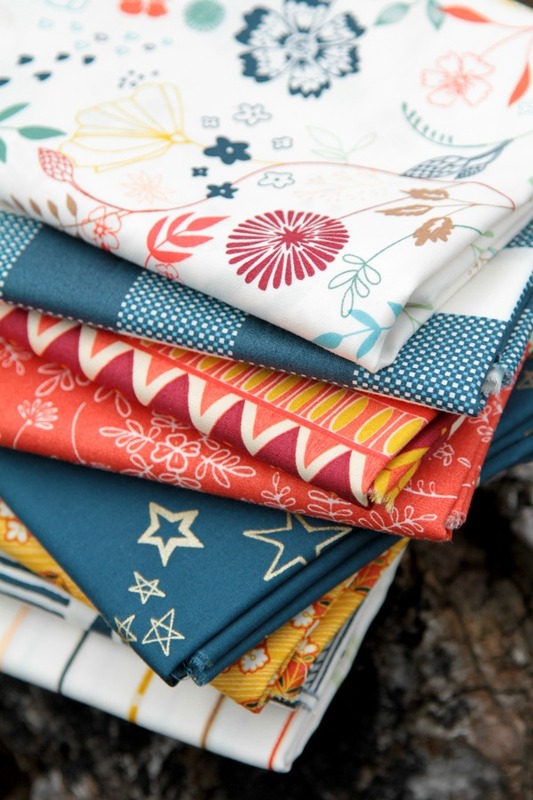 Your lovely fabrics would definitely go into a quilt! I now follow you on Instagram too! looking forward to seeing you in my feed! Im going to one day attempt a bag of some sort...with these fabrics! I would make a table runner, I think! I think my new granddaughter would get a new play quilt! Zipper pouches, scrappy mug rugs, anything- it's beautiful! I love the colors in these fabrics. I would make a table topper, love the colors. I follow you on blog loving and Instagram. I would definitely make some kind of quilt. I love this collection, and AG in general! I know it will look good with my other AG fabrics, and it will probably go in a quilt. Please count me in! This is a very pretty collection! I'd love to win it! I might make a really cool tote bag or a comfy throw quilt to wrap up in! I follow you on FB! Thanks for the great giveaway! Would love to make accent pillows and shams! Love this collection! Love the prints, I would make some spring outfits for my baby daughter. I follow with Feedly & IG. I would make a 'for me' quilt. Love the fabrics. I would use this fabric to make little sundresses for my 2 year old granddaughter and add to my pin cushion stash and mini quilt stash. I love this colorful fabric. Thanks for chance to win it. Not sure what I would make yet. Of course I follow you! Love your blog ! I would love a quilt in this fabric ! So much inspiration from you, Maureen. My couch needs some new pillows! Thanks for the giveaway! I follow you on FB and IG! I love your quilt as you go quilt and think I would try to make a similar one with this gorgeous fabric. Is like to make a nice lap blanket or some cushions. I follow you on Facebook. Thanks for the chance to win this gorgeous fabric. I would definately do a new tote bag!!!! I think I would make a stroller quilt with a matching tote.. in fact I see numerous fun combinations! I shared this contest post on Facebook. I follow you on facebook and instagram too!!! I just shared your facebook link on my facebook personal page, thank you for this opportunity!!! love love the new line!!! I would make some really neat totes to bring to the beach! I love your fabrics! and thanks for the giveaway. I would use these pretties in a Strippy Quilt! A quilt of course! It would be fab! So pretty it looks like a picnic. so ...a picnic cloth! I follow you on both FB and IG! I do really love the fabrics and a quilt is in my future. I would make a quilt. Most likely a wallhanging, because I don't have the attention span to make a quilt much bigger! Thanks for the chance to win these beautiful fabrics! I also follow on Bloglovin' and IG! 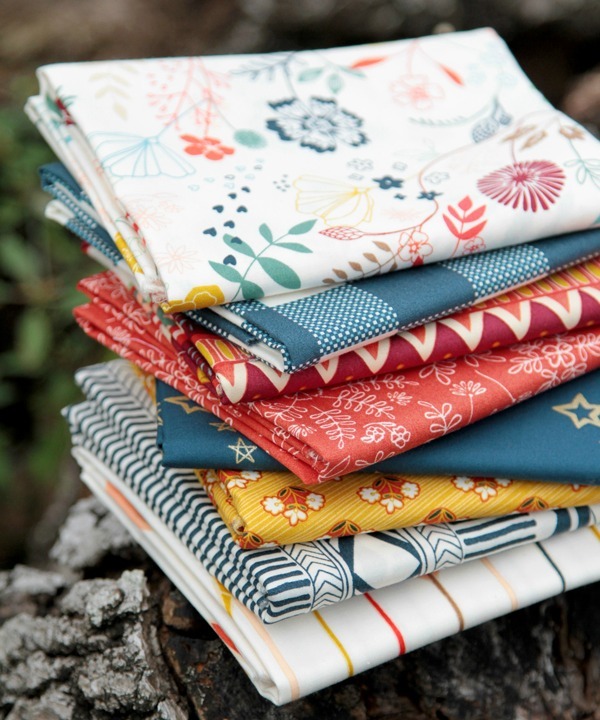 Oh my goodness YES I would love to stitch up this bundle of your gorgeous fabric ! There is no other like Art Gallery....They are so luxurious feeling. Thanks Maureen. I would make new pillow covers for the living room. If it weren't for you, I wouldn't have known it was sms giveaway day...I love those...I rarely win, but I love visiting sites and being inspired by new projects! These look like a summer day to me; maybe make utensil holders for the picnic basket? I follow as mickey louth on fb. Something really fun for the couch, a couple of pillows or a lap quilt! I follow you on the blog, fb and instagram! I follow you on facebook, I love seeing your post you are super talented!!! I think I would make cute bag and some napkins for a summer picnic. I have an idea for a cute wreath. I see sketchbook covers and zipper pouches and sassy strip purse. Mostly I would love to use some of it to make my great-granddaughter an outfit. Hmmm not sure what I would make. Maybe a lovely picnic blanket. Thanks for the chance. Pretty fabrics. I follow you via Google and Blogger. And I follow you on fb and ig. I'm seeing a few tote bags and some quilted zippered pouches out of this bundle! I follow on BL and Facebook! I love your line! I have a few pieces but would love more and make pillow covers to match my quilt. Thanks! I admire your string quilts made with your fabrics. A pillow would be great! I am your follower in all ways. I'd make a throw quilt. I just love this fabric collection! 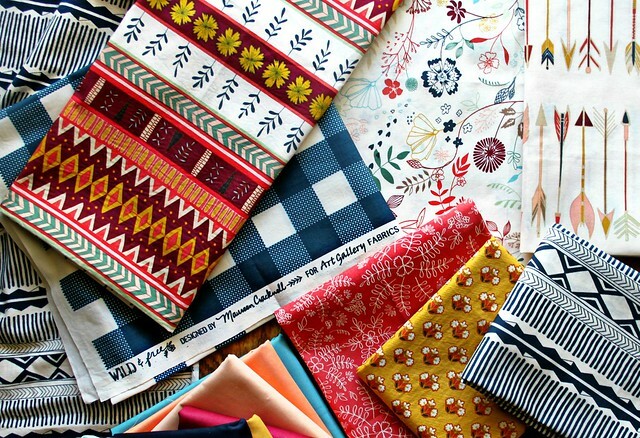 I would love to create a picnic quilt with these fabrics. In our 60s, my husband go somewhere green at least twice a week for lunch. Possibilities are endless,,,just love this collection! I follow you on Facebook. I follow you on FB under my real name, which I'll reveal if this post is chosen. Thanks! I'd love to make a quilt top with it, something with good size pieces so that the fabric can shine. I follow your blog in bloglovin. I would love to make a quilt or maybe even a pieced poolside tote. I'd like to try Purl Bee quilted pouches ! I would stitch up an awesome Indian stomp skirt! Follow you on FB and your blog. This collection would make a beautiful throw for ME. I'd probably make a cute tote bag or zipper pouches. I would like to make an arrow quilt out of the fabric. I would make a lap size quilt with the fabric. Thank you!